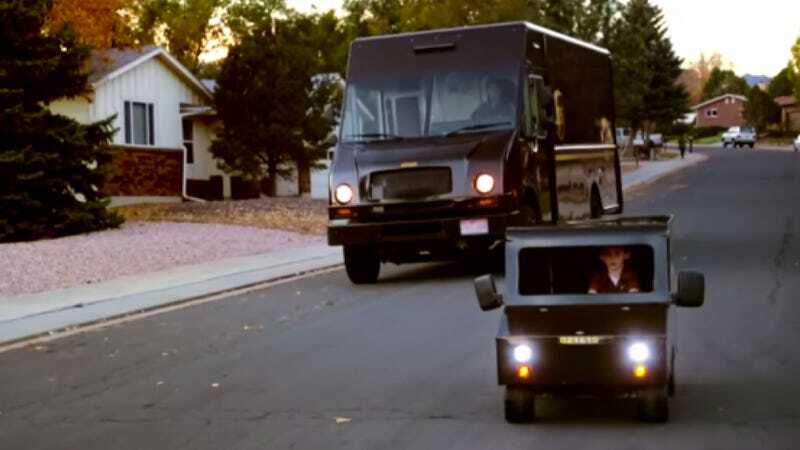 UPS has declared open defiance of child-labor laws; allowing four-year-old Carson Kight to deliver packages in a pint-size brown box truck. The kid was elated, and you can't watch his "Day As A Delivery Driver" without cracking a smile. Carson's mom Karen told KRDO that they'd been getting special formula delivered via UPS since the kid's birth because he can't drink anything with "milk protein in it." Apparently Carson "loved trucks in general" and was always fired up to see the UPS box rig. The family had built a relationship with the route's driver, "Mr. Ernie," who surprised Carson with a kid-sized delivery truck of his own and a few packages to bring to the neighbors. The event is tied in with UPS's "Wish Delivered" campaign which basically makes cute moments like this happen for kids. UPS donates $1 up to $100,000 to The Boys & Girls Clubs of America, The Salvation Army or Toys for Tots Literacy Program for every "wish suggestion" submitted on social media with the tag #WishesDelievered. Hat tip to Bret and Nosrat!